Teaching my children that true joy comes from serving others is really important to me, especially in today's world where it seems children (and adults alike) are continually bombarded with messages that tell them differently. These messages, whether they come via T.V. shows or movies, magazine articles, or advertisements, lead people to erroneously believe that the only things that truly matter are those things that center around them, creating an environment full of self-centered people. My hope for my children is that they will not grow up being self-centered individuals. 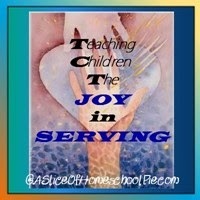 One of the best places for children to learn how to serve is within their own home. Provide your children with opportunities to serve you or other family members. In our home it can be as simple as asking my children to get me a drink, even though I could easily get it for myself, or asking my son to change a load of laundry for me. I also encourage my sons to serve each other. For example, one of my children sometimes takes over his sibling's chore. Serving doesn't only encompass doing something physical; it can also include a thoughtful or caring gesture towards someone. Here's an example; one day my oldest son was having difficulty with something he was trying to fix which put him in a sour mood. When my husband came down from his nap, my youngest son quickly went up to him and whispered in his ear explaining that his brother was upset and he asked his father not to tease his brother or upset him more (my husband enjoys teasing the boys quite often). We both agreed that this was a loving gesture on my youngest son's part and a wonderful way to have served his brother. Offer your children opportunities to serve outside your home. Children of all ages can do this. A young toddler can help put toys away inside a church's nursery room. Preschoolers can help pack gifts to give to children through an organization such as Operation Christmas Child. Elementary-aged children and those older can serve in so many ways. Recently, my children and I served at an organization called Child Evangelism Fellowship (CEF). My youngest child vacuumed and dusted the tables, while my oldest brushed off cobwebs. They also helped put labels on brochures and performed other miscellaneous duties. Find an organization that could use your help. You can do this by asking friends (that's how we found out about CEF), checking with your local church, or doing an online search for various non-profit organizations in your area. Be aware of what's going on in your neighborhood. Is there a yard whose grass hasn't been cut or a snow covered sidewalk that hasn't been plowed? These situations offer great opportunities to help someone out. Provide your children with as many serving opportunities as possible. You can also spread these service projects throughout the year. In a couple of weeks my children will be serving meals to the homeless and later in the month, will fill backpacks for our ministry, Operation Christmas Backpack. They will also be visiting a nursing home and blessing them with Christmas songs. My hope is that every time they serve someone they will experience that wonderful feeling inside that can only come through helping others. The day we went to CEF my youngest son said, "Mom, I feel this is going to be a waste of my time." On our way back home he said, "Mom, I was wrong. That wasn't a waste of my time." At that moment I knew he got it. I knew he had just experienced joy. What are some ways your children have served others?